Apple is cracking down hard on companies that have been abusing its Enterprise Certificate program, and Google today joined Facebook in losing access to Apple's internal app tools, reports The Verge. Apple revoked Google's Enterprise Certificate and as a result, none of Google's internal apps are functional. Pre-release versions of iOS apps like Google Maps, Hangouts, Gmail, and more stopped working today, along with employee transportation and cafe apps. Google, like Facebook, was using its Enterprise Certificate designed for internal employee apps to distribute an iOS app called "Screenwise Meter" to customers. 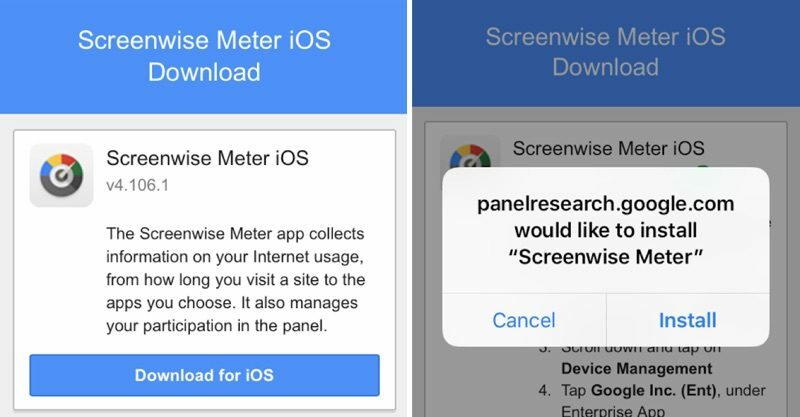 By having customers install Screenwise Meter this way, Google was able to bypass Apple's App Store rules. Google was more forthcoming about its data collection policies than Facebook, but it still clearly violated the Enterprise Certificate Program, which only allows these certificates to be used for internal apps for employees. Facebook was doing the same thing as Google with its "Facebook Research" app, and has also since lost access to its Enterprise Certificate, disabling all of the internal Facebook iOS apps and reportedly causing chaos within the company. Both Google and Facebook have disabled the apps that took advantage of Apple's Enterprise Certificate program, but that did not stop Apple from revoking their Enterprise Certificates entirely. Update: In a statement to Bloomberg, Google said it is working with Apple to resolve the issue. "We're working with Apple to fix a temporary disruption to some of our corporate iOS apps, which we expect will be resolved soon." Update 2: In a statement to TechCrunch, Apple says it is working with Google to fix the certificate issue. "We are working together with Google to help them reinstate their enterprise certificates very quickly." Update 3: Apple has restored Google’s Enterprise Certificate so its internal apps now function again, TechCrunch confirmed with a source after a Bloomberg journalist reported the development. A Google spokesperson said they "can confirm that our internal corporate apps have been restored." This ain't gonna end well for Apple. How? Apple said you can't collect my user's information through shady apps then Facebook and Google went "we'll see about that", they tried to outsmart Apple, they got caught and now Apple can rightfully punish them. It's likely this will be resolved by the end of the week. Apple will hem and haw about how they can't use the certs this way. Execs at Google and FB will apologize. New certs will be issued. In a way, this is good and bad. Good because Apple can stop these sorts of apps from being used. Bad because I'm not sure I'm comfortable with Apple having this much control over other large companies. Apple doesn't have control over other large companies. Apple does have some control over how other large companies use the services that Apple offers. I appreciate Tim and Apple's stance on privacy. It is one of the major reasons I proudly use Apple products. In my opinion, Apple should not reinstate said companies. Both companies have shown time and time again that they cannot and should not be trusted. Apple should stick to their privacy guns and say enough is enough. Otherwise, it will look like Apple has gotten soft when big money is involved. Aww, snap! Screw both Gulag Google And Farcebook. Forgive me as I don’t understand all of that, so I have a question. Will my gmail app stop working? What about google photos? As of now, they are working. Apps downloaded from the App Store are fine. It’s just their apps distributed with their special non-App Store certificate that are affected by this. Apple is on a roll, glad to see them putting these big companies under manners. Obviously, I think company executives at both Google and Facebook will likely enforce policies over time to require Android as a second handset. But, I am glad Apple is really committed to the privacy protections for its customers, even if they using it as marketing benefit. Data collection is just too much out of control. I bought Quaker Oats the other day, and its all I’m seeing on my Facebook Feed and TV commercials. Ok, so what’s the difference between Google and Facebook data mining and all the endless endless freemium apps on the App Store that data mine the hell out of everyone? Or is it the 30% cut Apple makes on those in app sales..?? This has nothing to do with data mining. This is about Facebook and Google letting consumers use apps on a platform that is designed for internal use only. I feel like the people writing these articles are doing a huge disservice by not explaining the issue correctly.